Plano Concrete Flooring, a unit of Artisan DecoCrete, is offering a new decorative concrete finishing system to businesses and homes in and around Plano and Dallas areas. The unique concrete finishing system, known as SkimStone, is a trowel applied, two-component cementitious decorative coating used for existing concrete surfaces such as countertops and floors. The acrylic-based Type I Solution is painted using SkimStone ColorPaks and the tinted Type I Solution can be combined with SkimStone White Powder to attain the proposed viscosity. SkimStone is fixed with SkimStone Protective Sealer. A three-coat use of thin layers brings about a distinctive textured appearance, and by using SkimStone one can create thousands of custom themes by mixing and blending colors as well as application techniques. This system is designed to produce a colorful, beautiful and textured appearance on countertops and concrete floors in exterior or interior applications. It is used for both outdoor and indoor surfaces to complement and update any block. Plano Concrete Flooring discusses with its clients in order to provide decorative concrete solutions suitable for their individual requirements. Besides SkimStone, Plano Concrete Flooring also provides a variety of decorative concrete products and services, including stamped, polished and stained concrete, vertical overlays, concrete stenciling, concrete repair and epoxy flooring. 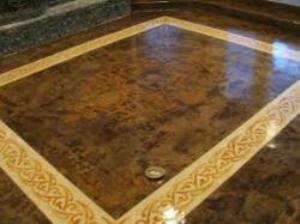 For the past 10 years, the company has been providing a full range of decorative services throughout North Texas.